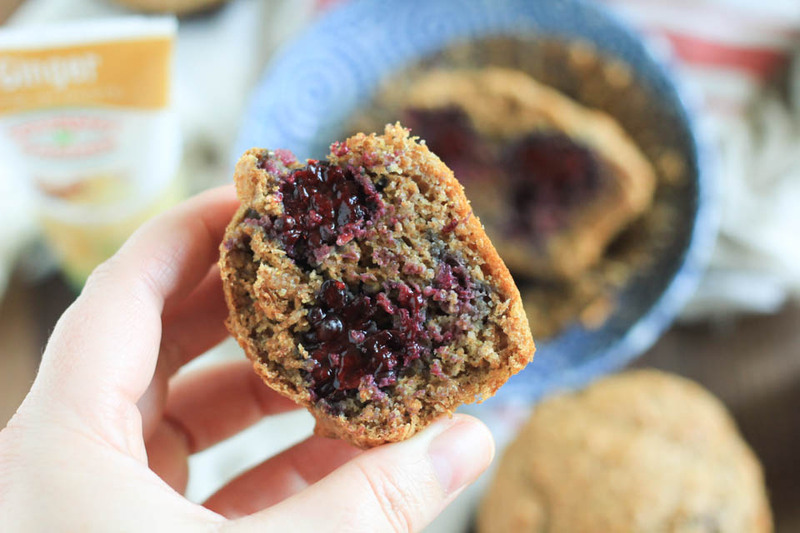 These Super Moist Blackberry Ginger Bran Muffins are a nod to a classic bran muffin but with more flavor added by the ginger and blackberries! Super tender and great for a slightly healthier muffin choice. I know what you’re thinking, am I nuts… Bran muffins?! I am kind of nuts and I do love my bran muffins more than most other muffins any day of the week. I’ve said it over and over, if I have a choice of a sugary breakfast muffin or bran/nutty/grainy, I choose the latter. Always and forever! It has been a baker lifelong mission to create a bran muffin that is low in sugar, high in flavor, this hit the bill so perfectly. I was in Sacramento a couple of years ago and ate the blackberry bran muffin of my dreams. I had to make it at home finally, and I did. Many times they are way too sweet, to cover the fact that they taste like bran. But I really am not into covering that flavor, I love it and the not so sweet version of it. I added a kick with the ginger that I love baking with, it adds the best flavor! It’s subtle and such good friends with the blackberries. It also lends a hand to the moisture in this muffin. Bran muffins can be dry, and that is no good. Adding the ginger really helps with texture and flavor of this glorious underused bran! My Mom even liked it, and she does not like bran muffins at all. I know when she likes something that I make that she normally doesn’t like, it must be a winner! I also used whole wheat pastry flour which has great flavor and a lighter protein than normal whole wheat flour. That will allow for a lighter and fluffier texture in the finished muffin. Which is a must and plus for bran muffins that can tend to be a bit dense. The pastry flour helps so much with that, so don’t skip it! 🙂 It can be found in all grocery store nowadays. Place oven rack in center of oven and preheat oven to 375 degrees. Line 10 standard muffin cups with paper liners, and spray with cooking or baking spray. In a large bowl whisk together bran, flour, baking powder, baking soda, cinnamon, and salt. In a medium bowl whisk together buttermilk, oil, honey or syrup, eggs, ginger, and vanilla. Add wet ingredients to dry, using a spatula, fold together very gently. Do not over mix, that can lead to a dense muffin. Add blackberries, using a spatula, fold in gently. Spoon into muffin liners evenly, place in oven and bake for 20-25 minutes or until a toothpick comes out of the center clean. Remove from muffin tin and place on wire rack to cool for 10 minutes. Enjoy after cooling, store on counter in an airtight container for 3 days, or place in fridge for up to 1 week. To freeze: place in an airtight freezer bag for up to 1 month. Allow to thaw on counter for a few hours before enjoying. That ginger in there is genius!! I love ginger everything but have never thought to put in a muffin! Great idea ! Great blue bowl too ! Thank you ! I’m a big fan of bran myself! I really like the addition of the berries too! Yum! 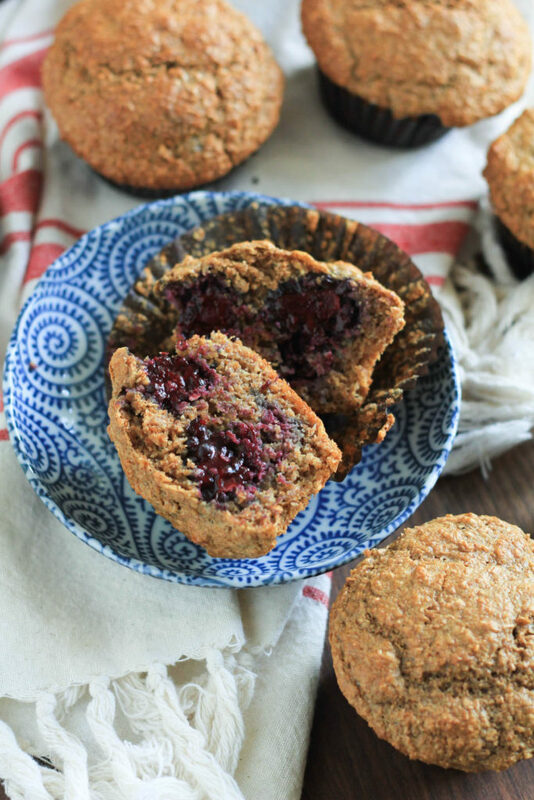 I’ve always loved bran muffins, they are my muffin of choice! 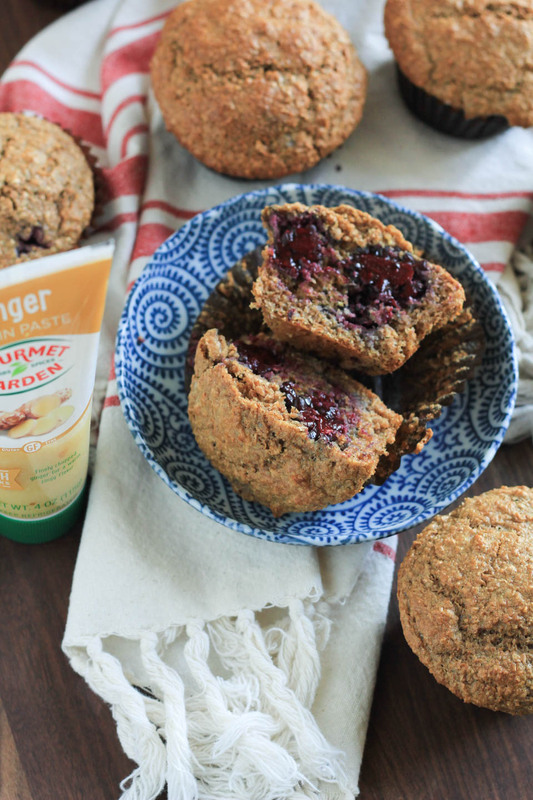 These muffins sound amazing with the addition of ginger and blackberrys! YUM! That is awesome! Bran lovers unite! I literally am OBSESSED WITH GINGER……and Gourmet Garden! I have their ginger in my fridge at all times, and it’s an emergency if I run out! These are SO happening! Hahahah ME TOO!!! I love how easy it is to add to anything.